“If you’re looking for a crime thriller to keep you on the edge of your seat right to the very last page, look no further. It’s 1976. Despite fierce international controversy over whether in vitro fertilization should ever be performed in humans, doctors around the world race to be first to produce a baby by this procedure. Dr. Colin Sanford, a brilliant, ambitious obstetrician in the Pacific Northwest city of Emerald, has a plan. He recruits Dr. Giselle Hearn, an experienced laboratory geneticist-embryologist at the University. Drs. Sanford and Hearn, working secretly, set out to put their names in history books. Several months later, Dr. Sanford’s patient, Joyce Kennett, gives birth to a healthy boy, and Sanford prepares to make an announcement at a press conference. But before it convenes, Ms. Kennett’s marginally schizophrenic husband kills Dr. Hearn and then himself. But is that what happened? A simple case of murder/suicide brought on by a man who forgot to take his medication? The Chief of Police seems to think so, and suggests the case be closed. 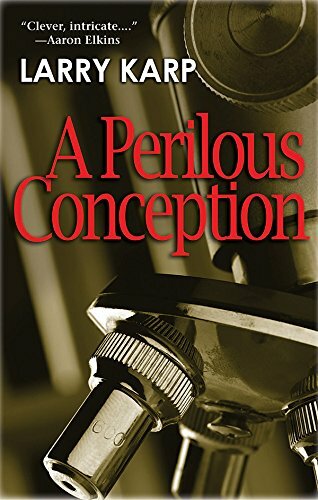 But Detective Bernie Baumgartner thinks otherwise when he discovers an irregularity when Hearn’s chair at the University OBGYN department Dr. L. Gerald Camnitz, who opposed the technique under moral and legal grounds, has vanished. Increasingly, Baumgartner also suspects that Sanford and Hearn were in fact doing IVF, that they succeeded with the Kennetts, and that murder, suicide, and other crimes may well have resulted because of their action. The fact that his investigation is being deliberately hampered by influential people at the University galvanizes Baumgartner into finding the truth, come hell or high water. A cat-and-mouse game quickly develops between Sanford and the tenacious Baumgartner, but there can only be one winner. . . .
Interestingly, this fast-paced story is told from the viewpoint of both protagonist and antagonist. In lesser hands, it would be muddled and disconcerting, but thankfully, Larry Karp has mastered the technique fluently with not a bump in sight. Detective Bernie Baumgartner is a fascinating and compelling character, and no doubt we will be seeing more of him in future books. If you’re looking for a crime thriller to keep you on the edge of your seat right to the very last page, look no further. A Perilous Conception is just what the doctor ordered.